After you've worked hard all day and programmed all night, the last thing you need is to have your few hours of sleep disturbed by alley cats howling on your back fence. There are three of the buggers--a green one, a white one and a pink one. Every now and then one jumps up where you can hit it with a tin can, if you're quick enough. 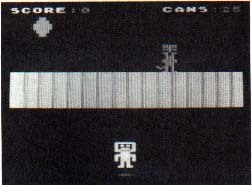 That's the scenario for Tin Pan Alley Cats, a one-player game requiring joystick and 16K RAM. You start out with 25 tin cans that you can kick toward the fence by pressing the fire button. But first you must move horizontally along the fence to lineup under the cats as they appear and disappear at random. The pink cat is the fastest, and hitting it scores the most points. The green cat is slowest, and hitting it yields the least. The cats will appear 35 times during a game, and the pace quickens as you use up your cans. When you hit a cat you will see it and hear it, and points will be added to your score. If you score 2,000 points, you get five extra cans, and the cats appear five extra times. The bonus is repeated if you reach 3,000 and 4,000 points. The high score of your session is saved after each round. The difficulty of the game can be adjusted by changing the value of TUF in lines 280-310. Thanks go to Stan Ockers for his ideas on vertical blank interrupts (ANTIC, June 1982). We modified the VBI into a fast joystick routine. We also thank Jerry White for his ideas on sounds and the ATARI (ANTIC, October 1982).